The new Processing tab in the Audio Setup preferences. 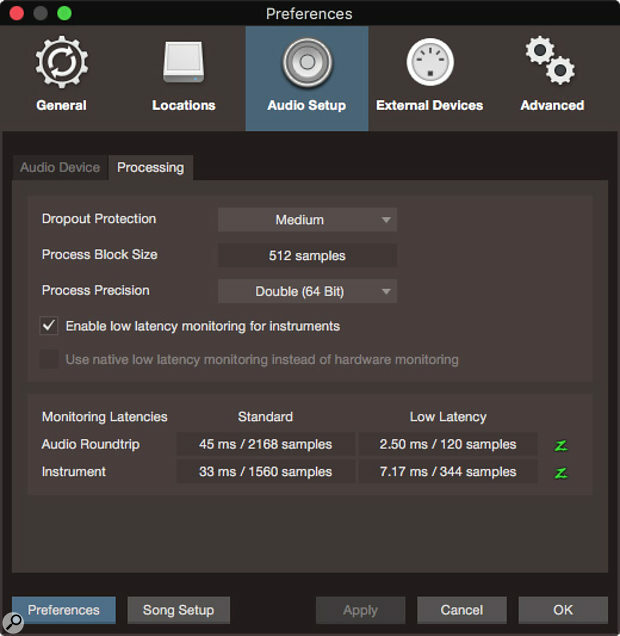 Dropout Protection is set in the upper section of the tab, while monitoring latencies for audio and instrument tracks are displayed in the bottom half. The new Studio One v3.5 upgrade is short on gimmicks and long on real improvements. Here’s what’s new. Music software development is very often focused on adding flashy new features. We all love those, but programs people rely on as primary tools, such as Studio One, attain their greatest usefulness when functionality is augmented or upgraded over time. So it’s laudable to see PreSonus focusing on the program’s performance, technological core and basic infrastructure in the new version 3.5 of Studio One — although there are some cool new features, too! One really important thing to note is that version 3.5 uses different Song and Project file formats, and converts old files when it opens them. If you have any reason to want to preserve files in the old format (such as being in the middle of a project), make copies before you start working on files. There is no way to convert a file back to the older format. One of the headline features in 3.5 is that PreSonus have rewritten the audio engine for greater efficiency. The most obvious ramification of this should be better low-latency performance, especially when high-bandwidth audio interfaces are used. Naturally, PreSonus are pushing their new Quantum Thunderbolt 2 interface, but you should be able to get the same level of performance with other high-bandwidth devices like my MOTU AVB interfaces. Even with USB2 interfaces you should see some improvement, but the idea is that with a high-bandwidth interface you can get latencies much closer to those of interfaces with onboard hardware-based mixing. In fact, my MOTU interfaces do have onboard DSP hardware, but Studio One’s improved software latency still will really help when I’m doing punch-ins, where I now can monitor both the existing track and the input with low latency, which was hard to achieve before. It will also be a boon to those using virtual instruments. Version 3.5 adds an additional playback buffer to protect against dropouts. This Dropout Protection buffer is in addition to the buffer size set as the Device Block Size. Low-latency software monitoring depends on both settings, and can only be enabled with appropriate settings for them. Speaking broadly, this means low Device Block Size and medium to high Dropout Protection. The Project page receives a lot of love in this update. First, let’s talk about track IDs. Track ID markers (start and stop) in earlier versions were fixed at the beginning and end of each track on the Project page. Now they are independent of the files, allowing multiple files to be combined into one track or, conversely, allowing tracks to start in the middle of a file, as might be desired with a live recording. Alas, positional markers were not implemented in this update, so I still can’t drop markers at the loudest spot in each track and jump between them for level matching. Maybe next time? Track ID markers are now independent of files on the Project page. Here, two files have been combined into a single track by setting the track ID markers to encompass both files. Metering in the Project page has also received a nice overhaul. New display types have been added to the spectrum meter, and are now chosen using a drop-down menu in place of the buttons that were there before; there’s also a new display freeze button that allows you to grab and examine the spectrum at one moment. But the biggest metering changes are just below the spectrum meter. Level meter types are also in a drop-down menu now, but a new type has been added: EBU R128. This is one of several standard loudness metering schemes based on the global ITU BS.1770-3 loudness standard. It is important to note that EBU R128 is the European broadcast standard, which differs in small ways from ATSC A/85, the US broadcast standard, and from BS.1770 variants used in Australia, Japan and elsewhere. In practice, the differences usually will not be an issue, but users outside of Europe should at least be aware of Studio One’s use of the EBU standard (chosen because Studio One is written by PreSonus Audio Software in Germany). Loudness metering on the Project page has been greatly expanded. The same options are available in the Level Meter plug-in, as well. With the EBU R128 option selected you will notice an orange box on the level meter. This indicates dynamic range from moment to moment. There are a good half-dozen more loudness readouts, but explaining the EBU R128 loudness parameters is beyond the scope of this column. 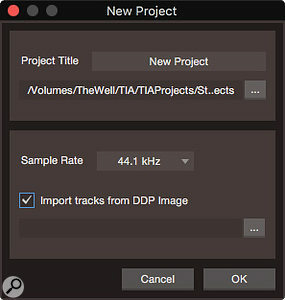 For individual tracks, both pre- and post-processing metering are available. The bottom line is that PreSonus have greatly expanded Studio One’s loudness metering, and if you haven’t really embraced loudness metering yet, you should get with the programme. Best of all, these improvements are not limited to the Project page; the Level Meter plug-in on the Song page boasts these features as well. The Import DDP feature is accessed by a tick box in the New Project dialogue.The last Project page upgrade I want to mention is DDP import. It’s great to be able to generate DDP file sets for CD replication, but it is important to be able to verify them before delivery to a pressing plant, and it is occasionally necessary to open and edit a DDP image. 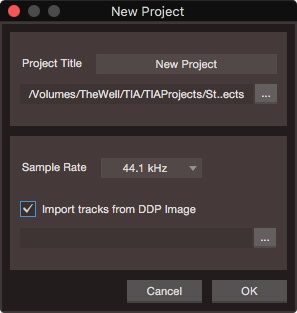 This feature is a little hidden; to find it you have to create a new Project and click the ‘Import tracks from DDP Image’ box in the New Project dialogue. When you navigate to your DDP image in the Open dialogue, select only the folder containing the fileset: individual files are greyed out and so can’t be selected. The mixer (or ‘console’, as it is called in some parts of Studio One) has also been enhanced in version 3.5. Maybe the biggest new feature is undo. Simply put, in the past, fader moves and other mixer activity was not undoable; now, they are. While the strongest user request was for fader undo, PreSonus went ahead and made just about everything, including plug-in adjustments, undoable. This is a great improvement. Bypassed plug-ins are now easy to identify by their orange-coloured active/inactive buttons.There are several other simple but really useful enhancements, too. One is that when a plug-in is bypassed, there is now a visual indication in the mixer (the in/out button turns orange); previously, there was no way to know if a plug-in was bypassed without opening its edit window. At the top is a folder track routed to a bus channel as a submix. On the bottom left, a folder button appears at the bottom of the bus channel. This button is the same one as the one on the folder track. 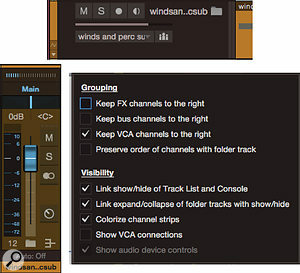 To make the channels collapse when the tracks collapse, tick the first two options under Visibility in the mixer options dialogue on the bottom right.A second nice touch is that when a number of tracks are collected in a track folder and the track folder is assigned to a bus channel (as a submix), a folder icon button duplicating the one on the folder track now appears on the bus channel. Inherently, this button will only show/hide tracks in the Arrange view, but you can make it also show/hide channels in the mixer. Click the wrench icon in the upper left corner of the mixer and, in the options dialogue that appears, click both the ‘Link show/hide of Track List and Console’ box and the ‘Link expand/collapse of folder tracks with show/hide’ button. 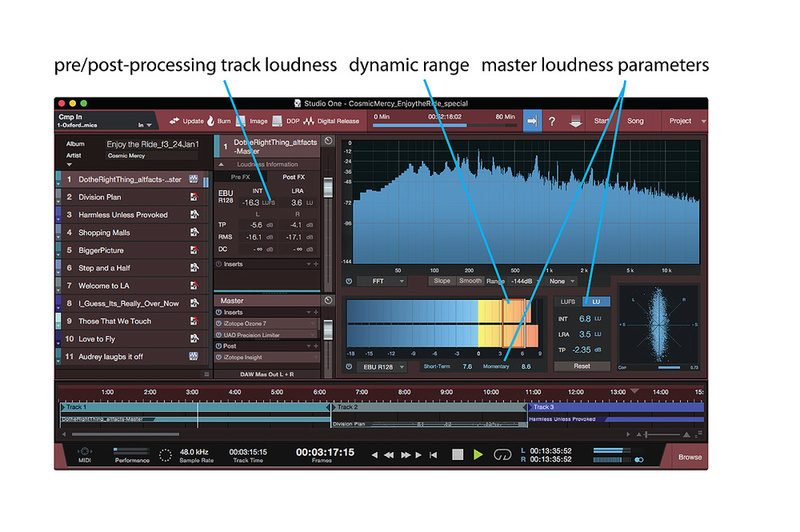 More worthy improvements include enhancements to the Fat Channel plug-in, with a reworked user interface and new compressor and EQ models, while there’s also a new Bounce Track command, which differs from the Export Stems command in that it does not include master processing when it bounces. Overall, version 3.5 might not add a lot of super-hot new features like Console FX, but it would be a big mistake to think of it as an unexciting upgrade. It adds a lot of ‘beef’, and the more you use your DAW, the more you appreciate when its core is strengthened. Besides, and best of all, version 3.5 is a free upgrade, as have been all upgrades within major versions of Studio One. This represents genuine return on investment. Thanks, PreSonus! Version 3.5 tightens up integration between Studio One and Notion, PreSonus’s notation package. It is now possible to import tracks from Studio One into an existing open Notion document, rather than always being forced to create a new document to import tracks. It works in the reverse direction, too: Notion parts can be imported into an existing Studio One document. It’s a smart import, which looks for existing tracks that match those being imported, and, if any are found, offers a choice of merging the new information or creating a new document. Last, but certainly not least, Studio One and Notion now share full tempo maps, including time-signature changes.